Hi all, if you are planning to go to Koh Samui from Malaysia.. here some guideline to share with you. There are 2 ways to go to Koh Samui by flight... Either you choose to go with Air Asia or Firefly. Kedua-dua ada kelebihan dan kekurangannya. My journey started from Airport at 10.35 AM and arived at Surat Thani around 11.35 AM, Thailand time. At the airport, as usual... you have to go through few immigration processes and took around half and hour or 1 hour... So, around 12.30 we move from the airport to Donsak Jetty by bus. The bus is really easy to get. Once you walk out from the arrival hall, there was a booth that sell the transport package to Koh Samui... all in one (Bus, ferry and van) with cost of 500 Baht. You can buy for two ways trip.. Terus-terang TWH nak bagitau dekat sini.. The Bus is really really slow... derhhhh..!!! Rasanya semua penumpang dalam bas dah tahap bosan nak mati... almost 2 hour terperap dalam bas yang super bosan tu and at last we arrived at the Donsak Pier. We took ferry at 2.30 PM. TWH boleh gambarkan Ferry tersebut lebih kurang macam ferry dekat Penang... Mungkin lebih besar. Siap ada servis urut kaki lagi... 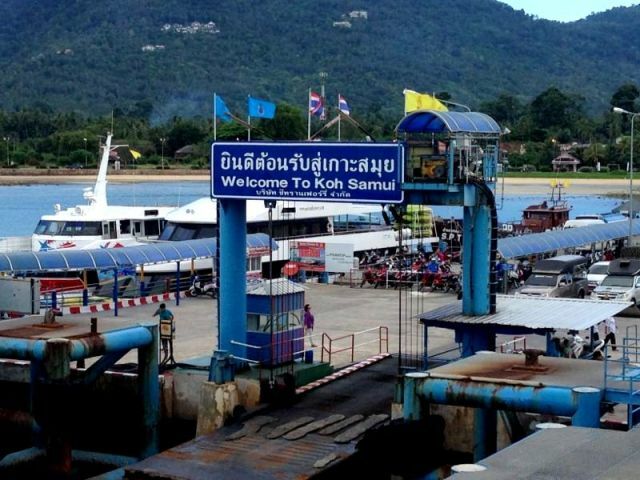 This ferry will take 1 hour 30 minutes to Koh Samui. Once we arrive at Koh Samui, there was a van driver come and welcome us and ride us to the Ark Bar Hotel. Its took 45 minutes from the jetty to the hotel. Kalau tak silap TWH, keluasan Koh Samui lebih kurang macam langkawi kot... tapi kalau anda nak tau lebih detail boleh please google sendiri. If you chose to fly with Firefly, you can start your journey from Subang Airport and the flight will strictly touch down inside the island. the advantage is - you can save your time and energy taking bus and ferry. It's much easier... pls bear in mind that the flight ticket may not as cheaper as Air Asia.